Recorded as MacMurray, McMurray, Murray, Murrey, Moray, and possibly others, this famous and interesting surname is generally thought to be Scottish, may sometimes be Irish, and occasionally is English! It has four possible origins. The first is locational from the Moray Firth in North East Scotland. This area is thought to be named from pre 10th century Old Celtic and Gaelic elements meaning a settlement by the sea. The second is probably associated, being a development of the Gaelic Mac Muireadhaigh, meaning the son of the sea man. The third is also Gaelic, and probably Irish from Mac giolla Mhuire, meaning the son of the follower of the Virgin Mary, whilst the fourth is English, and a variant of the surname Merry. This was a medieval nickname surname for someone of a cheerful disposition from the pre 7th century word "myrige", meaning pleasant. In Scotland the main family of Murray can be traced to a Flemish settler, Hugh Freskin, who in 1130 obtained extensive grants of land in Morayshire from which the name was taken. 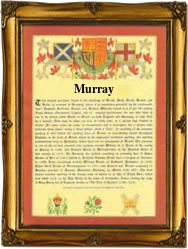 Lord George Murray famous for his part in the 1745 uprising, came from this family. Had he been left in command of the Scottish army, he may well have won the battle of Culloden, and thereby changed the whole face of Scottish and British history.The first recorded spelling of the family name is shown to be that of William de Moravia. This was dated 1203, when he was a witness at the abbey of Holyrood, Scotland, during the reign of King William, the Lyon, of Scotland, 1165 - 1214. Throughout the centuries, surnames in every country have continued to "develop" often leading to astonishing variants of the original spelling.